Are these scrumptious looking or what? These lemon squares are the perfect balance of sweet and sour. They are so addicting that I am unable to rest until they have all been devoured. It’s sad but true. I’ve been making these lemon delights since I was a young girl. I don’t even know where the original recipe originated from; it’s just scribbled on a piece of paper that is now yellowing from age. The best part about these little pleasure bombs is that they are so easy to make, requiring zero kitchen skills. You don’t even have to get your mixer out. So let’s get to work, the faster we make them, the sooner we eat. Here are your ingredients; all normal kitchen staples, I bet you don’t even have to go to the store. Flour, butter. 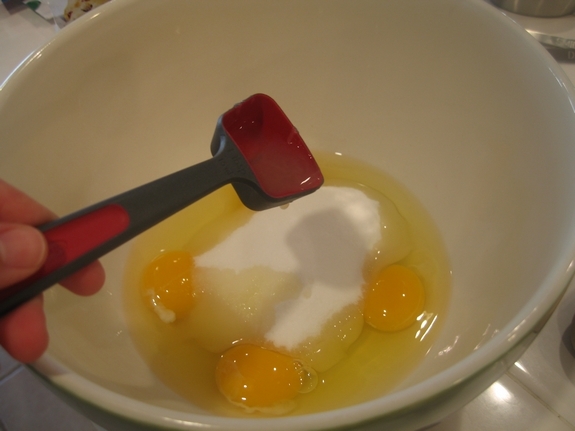 sugar (granulated and powdered), eggs, lemons, baking powder and salt. Start by greasing a 9 x 13 pan with butter or cooking spray. I like the cooking spray called Baker’s Joy that has flour in it. 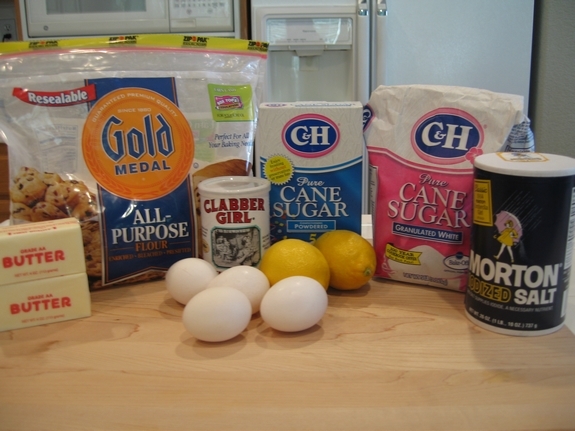 First we are going to make the beautiful golden crust for the bottom of the lemon squares. 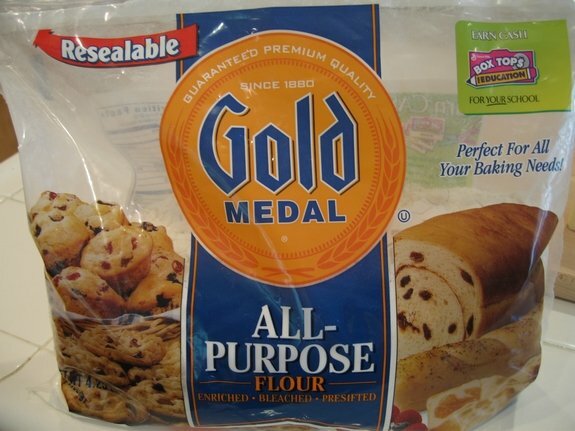 So get out your all-purpose flour. I swear I buy flour every time I go to the market. It’s pretty scary how much white flour we’re eating over here. 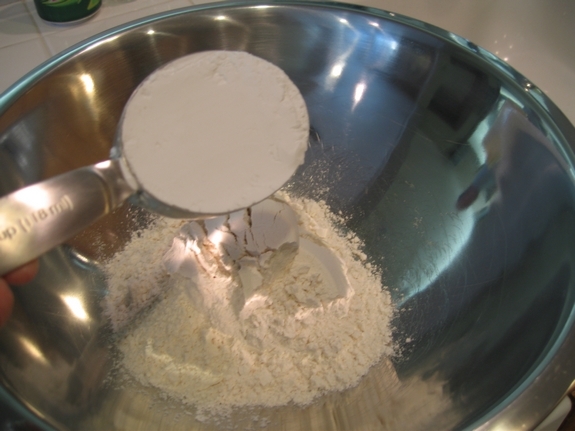 Add 2 cups of flour to a mixing bowl. Now fetch the powdered sugar or the confectioner’s sugar, if you want to talk fancy. I think more people know what you are talking about when you say powdered. But whatever term you use I will still love you. Now put two spoonfuls in your mouth like I always do. I really do, it’s so good. 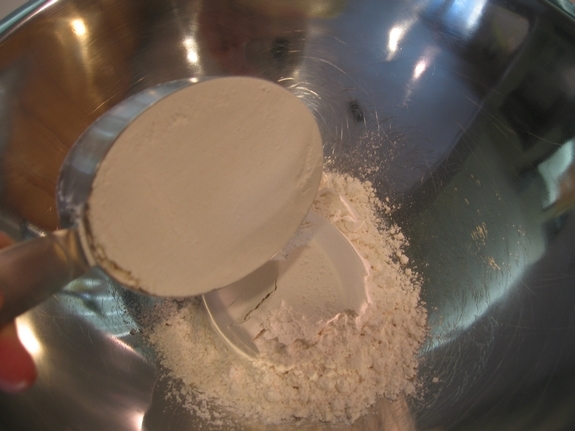 Add 1/2 cup of powdered sugar to the flour. Just plop it in…no skill required. 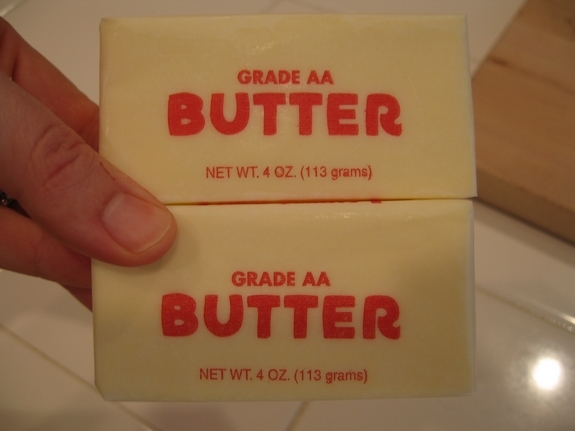 Now for the most important ingredient; the Grand Poobah of the culinary world, BUTTER. Two sticks even! This is what makes the crust of these squares so over-the-top. You’ll see. 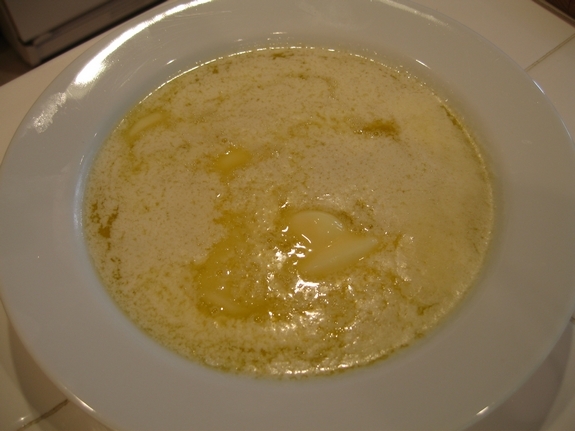 Now take your glorious 2 sticks of butter (1 cup) and melt them in a saucepan or in the microwave if you’re lazy like me. 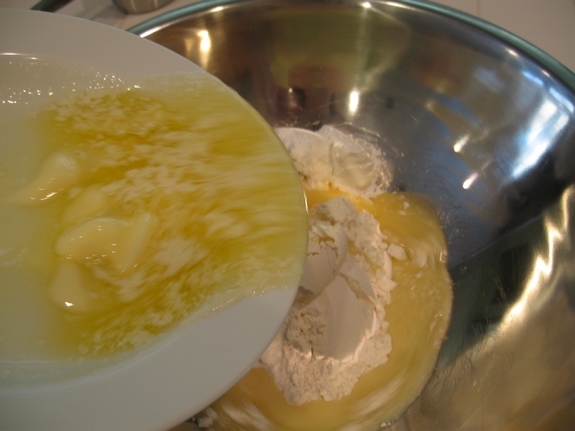 Pour the melted butter into the flour-sugar mixture. This is quite the action shot huh? Ahhh, a waterfall of butter. 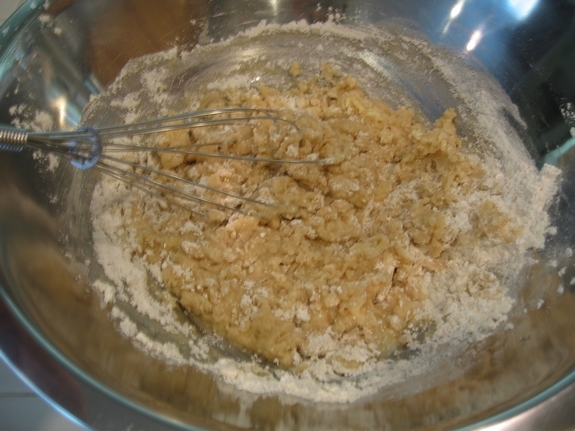 With a whisk or wooden spoon stir the mixture together until all the dry ingredients have incorporated with the wet. 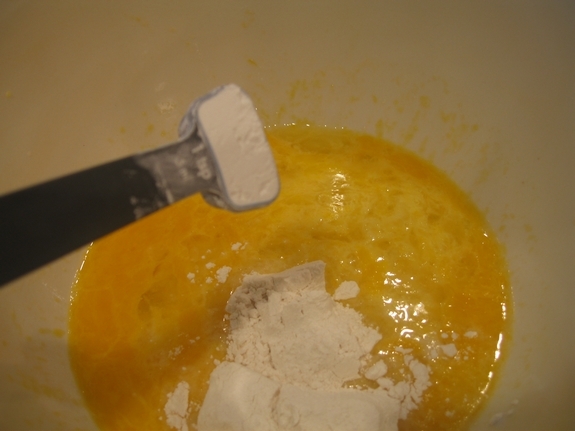 This is what the mixture will look like. Taste it, it’s good. Dump it into your already greased 9 x 13 pan. 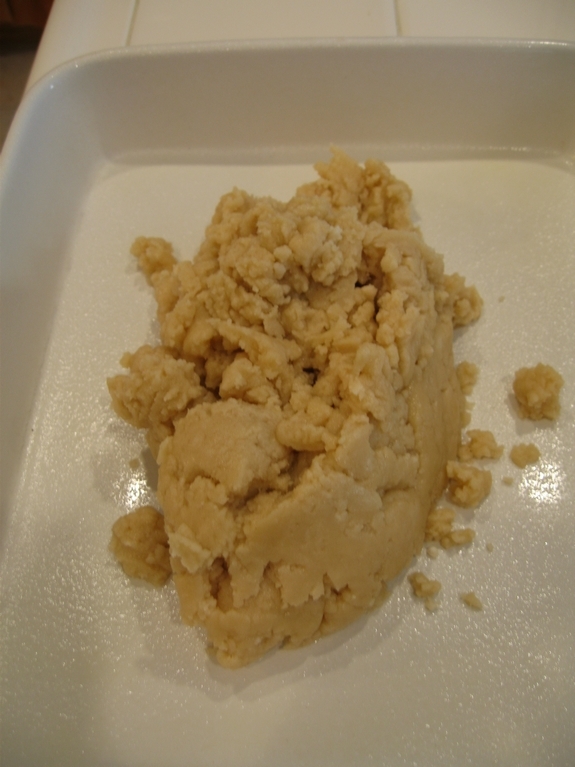 Press the dough into the pan with your fingers until it looks like this. It does not need to be perfect since it will eventually be covered with the filling. Do you see the shimmer on this? That’s the BUTTER! Place pan into a 350 degree oven for 20 minutes. When it comes out of the oven it will look like this, only better due to the pathetic photography. The edges will be slightly golden brown. Let this cool completely before adding the topping that we will now make. 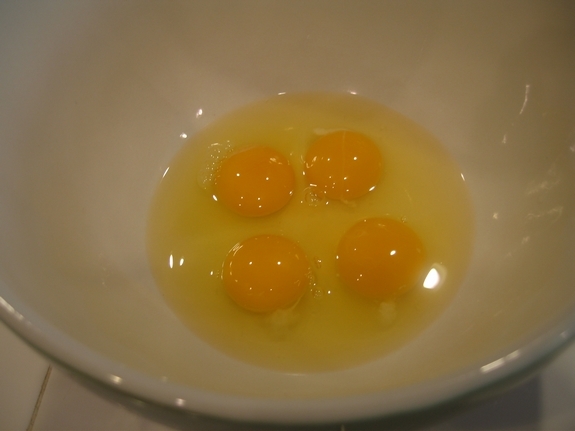 Let’s start with 4 large eggs in a mixing bowl. Hello four-eyes. 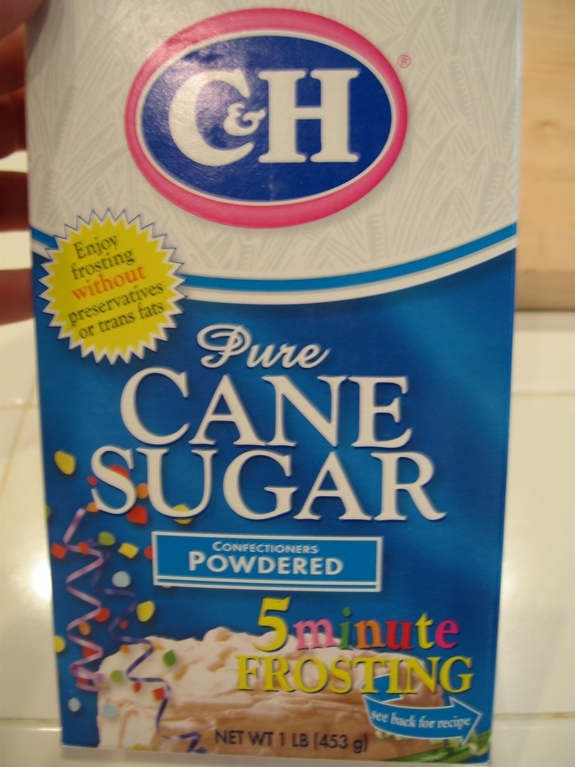 Now for the granulated sugar or regular sugar as I refer to it. 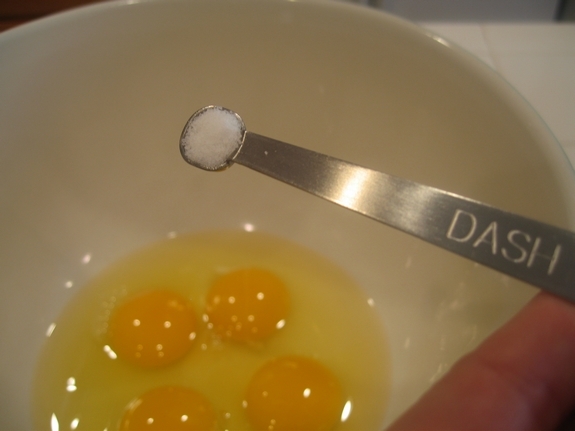 Add 2 cups of sugar to the four eyes, I mean four eggs. 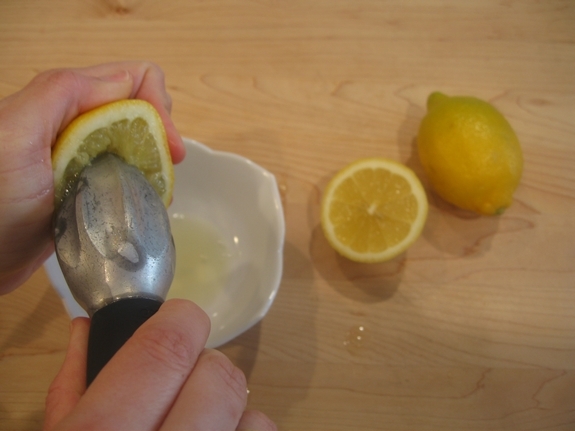 Now it’s lemon squeezing time again, using my favorite tool! Add 6 Tablespoons of lemon juice. Don’t you love the shadowing in this picture. It’s those pesky overhead kitchen lights that are totally interfering with all my pictures! Now aren’t these the cutest things you’ve ever seen. I mean I never had any idea what was bigger; a dash, a pinch or a smidgen. Now I know, but I love using them because I am a very exacting-type person who loves to measure things. 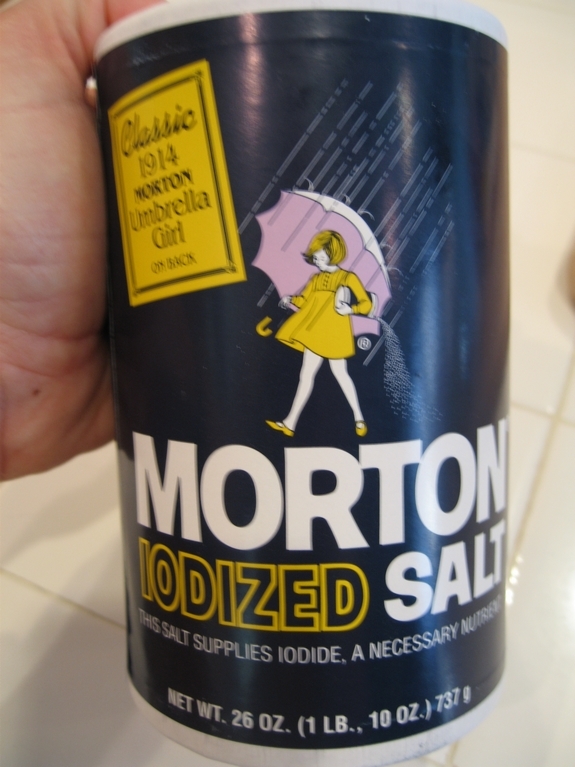 We will be using a dash of salt. It looks like I added the salt before the sugar but it does not matter. Now whisk all of this together. Get the flour out again. See this is why I’m always buying flour. Add 4 Tablespoons of flour. Find the baking powder. 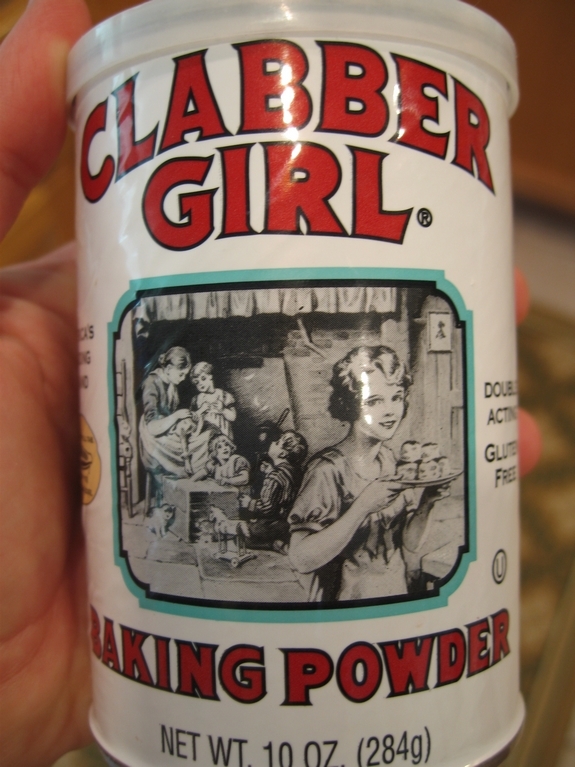 Who would ever want to be known as Clabber Girl? 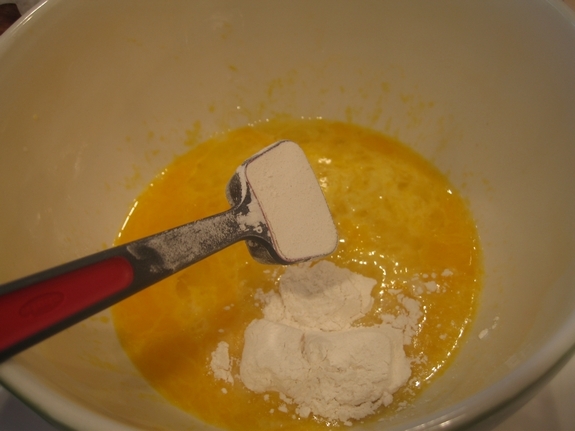 Add 1 teaspoon of baking powder to the mixture. Whisk it all up again. Pour the mixture on top of the already cooled crust and put in a 350 degree oven for 25 minutes. Make sure it is fully baked and not runny before removing from the oven. When it comes out of the oven sprinkle powdered sugar on top while it’s still hot. Sprinkle again when it has completely cooled. Wait until it’s completely cool and then slice into squares. Then you’re left with this. And lots of guilt. And inner thighs that are becoming kissing cousins. Again culinary simplicity at its finest. You’ll love these, I promise. Preheat oven to 350 degrees. Grease a 9 x 13 pan with butter or cooking spray. 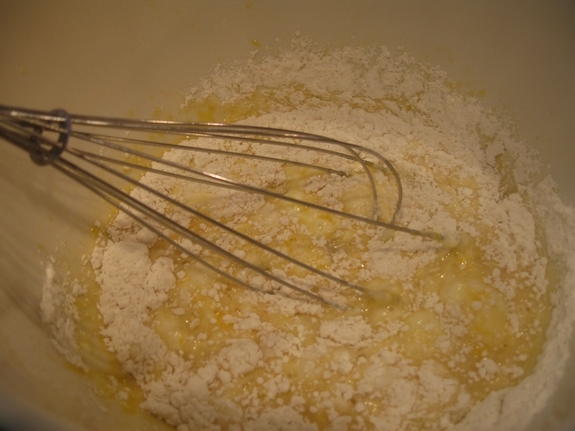 Combine 2 cups of flour, 1/2 cup powdered sugar and butter. 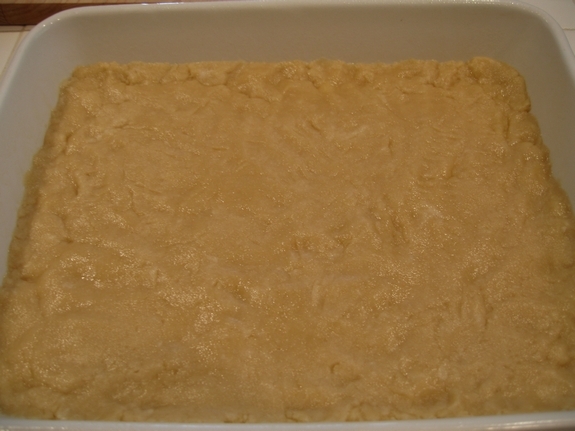 Make into a dough and press into a 9 x 13 pan. Bake for 20 minutes until edges are golden brown. Let completely cool. 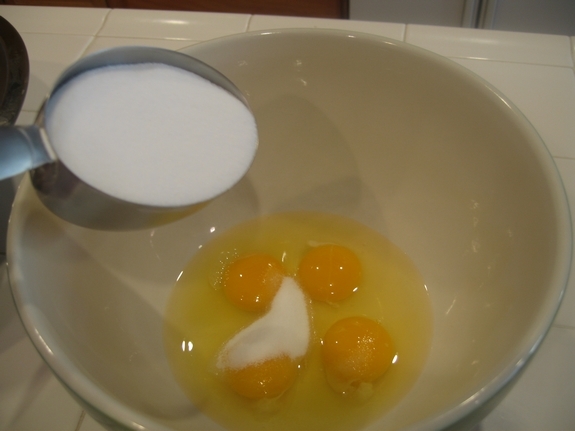 Combine eggs, granulated sugar, lemon juice and salt. Whisk together. Fold in 4 Tablespoons of flour and baking powder until combined. Poor mixture over all ready cooled crust and bake at the same temperature for 25 minutes; make sure it is fully baked before removing from the oven in all spots otherwise it will be runny. 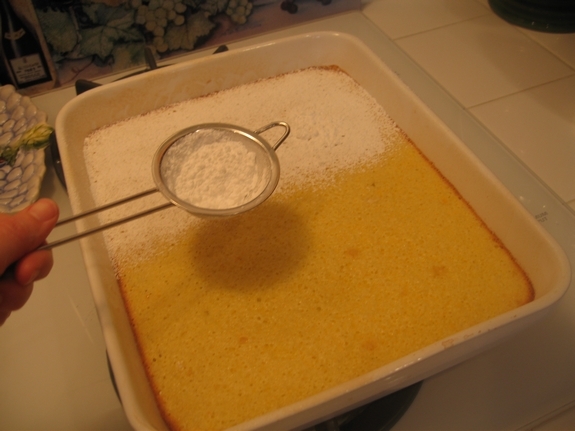 Sprinkle powdered sugar over the baked lemon squares while still hot from the oven. Sprinkle again once the squares have cooled. Hide these from the kids, they will eat them all! « Get This Wine…before it’s gone!! I love the little smidgen/pinch/dash spoons. They are too cute. 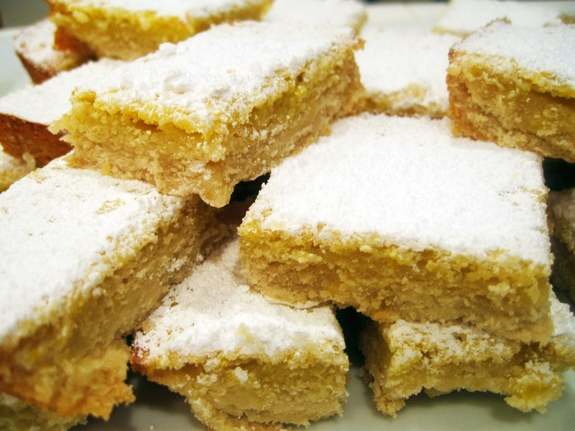 And the lemon squares look delicious! These look so yummy! I have a meeting this week I gotta bring a treat to. I think I know what I’m making! These are my downfall, my weakness… even above cookies. I don’t dare make them. Ever. I wonder how long I will adhere to that statement! Those lemon bars look so good! Bookmarked to try. 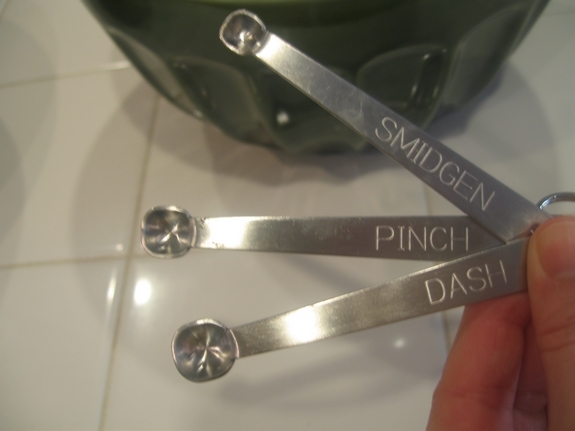 Nice pinch, smidgen and dash measuring spoons! how am i supposed to get into a bathing suit in st. lucia in two weeks…if i’m going to be eating my weight in lemon squares?!?!?!?! I love those measuring spoons!! (bars look good too). these look amazing, i am always on the lookout for a great lemon bar recipe! thanks. This looks like another scrummy recipe and I just can’t wait to try it. I love the way you present your recipes. Keep it up. I just StumbledUpon this page. I already copied this recipe and I’m going to look over the rest of your site. Count me as a new fan! This looks fantastic. Everyone in my family loves anything lemon! 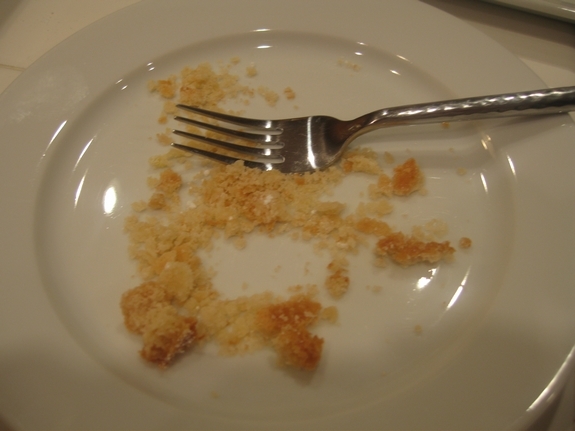 Wow I love lemon squares… I’m surprised that’s all the lemon juice it calls for. I also StumbledUpon this page. I am going to bookmark this site.. I love all the pics! I’m in heaven! I love lemon squares and yours look really good. I’ll take a dozen or two or three. Delicious! These were delicious and really easy! I did find that my filling didn’t come out as bread like as yours, Any seggestions? More flour? Hi There, I just stumbled accross your blog on by using stumbleupon and am loving the design! I dont normally stop at blogs relating to food as I already have 20 in my RSS feed and dont even have time to read them! I do like the design though and the use of photos is awesome. I started off blogging as well and always tried to keep a clean design like yours but it aint always easy with all the things you have to fit in! If you feel like showing off any of the cool food pics i’d love to see them on my site for foodies http://www.ifoods.tv so as all the other foodies can see them! Keep up the good work on the design and happy cooking! Those look scrumptious. I wish they didn’t have eggs. Sigh. It’s still fun to look. Just made these tonight and they’re fantastic! Mine required more time in the oven (about 25-30 for the crust and about 35 for the filling) but that might just be my oven. Next time I’m going experiment with my mom’s lemon bread frosting! It’s essentially more lemon juice thickened with granulated sugar- delicious! It might be over kill though. Thanks for the recipe! It’s going in my book! i tried this recipe but when i put the filling for the top on, and cooked it, it kinda ended up looking a bit like baked eggs on top of crust. Also, it didn’t completely cook and was very liquidy beneath a eggy crust. What the hey did I do wrong?! I wanted to make this so badly and it ended up made really bad. I tried making these, but the crust pulled away from the side and I ended up with squooshy lemony doom, as the topping went down the sides and underneath. It tasted delicious, but I was wondering if you had any tips to prevent such disaster? i am always on the lookout for a great lemon bar recipe! thanks. Want to come back to this page-thinking about making this recipe. First, I love your presentation and your sense of humor. Second, I have a family reunion tomorrow and a cousin who requested I bring lemon bars. I am making these. They look absolutely yummy! These are really good. I am making a second batch but have increased the filing by about 25%…..Also added lemon zest they just were not lemony enough for our taste. 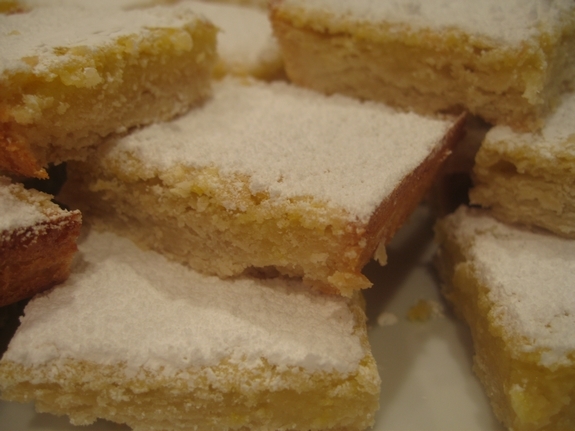 I saw this Noble Pig blog and your comment about lemon squares (they were kind of eggy…. Did you use a metal pan? 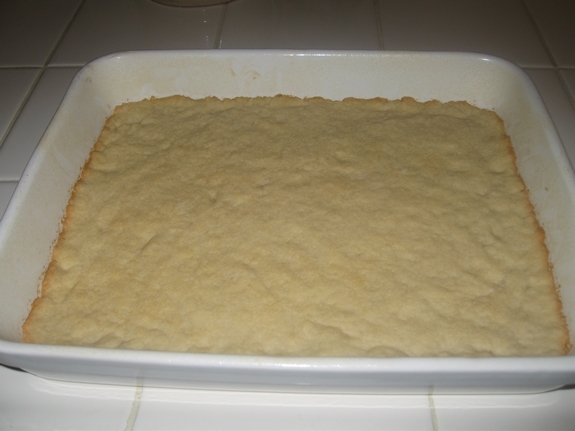 I swear that using a metal pan is not good for lemon squares… They taste awfully eggy…. I use a 9×13 glass pyrex dish and my family adores my lemon squares (haven’t made them recently because I can’t find my recipe, but it seems that most recipes call for 4 eggs, and I think my recipe called for only 3 eggs… maybe that’s the difference? these were absolutely delightful! i loved all the pictures for each of the steps in the recipe. i would only suggest using a wooden spoon to mix the dough for the crust. 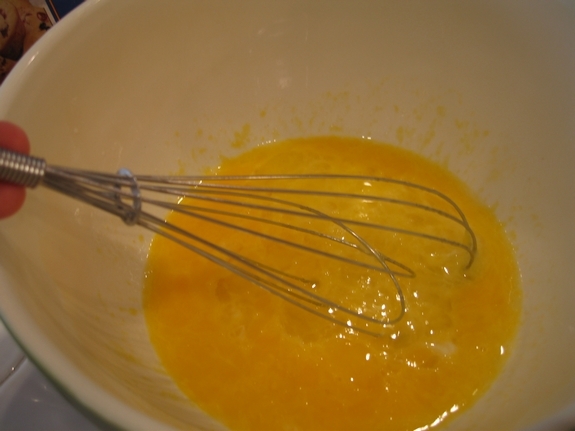 the batter ended up getting caught in my whisk. otherwise, this recipe was absolutely heavenly! thank you! You are hilarious! Love your easy going commentary and photos. I am looking forward to making these very soon. i live in a tropical country and having trouble with the confectioner’s sugar on top on the filling. the filling absorbs the sugar after some time so it looks like there’s no sugar at all. i guess the sugar melted. any tips on letting the confectioner’s sugar stay visible on top? I would sprinkle the sugar right out of the oven as directed and apply another layer after they are cooled. However, humidity might still remain a problem. I just tried these and they’ve turned out BEAUTIFULLY. I’m taking them to a party tonight and I’m sure they’ll be a hit. Thank you so much for the lovely recipe! I tried your recipe and it was delicious! The only change I made was 3 eggs instead of 4. I also think that maybe 1 1/2 cups instead of 2 cups of sugar would be better. Other than that, great lemon squares! Thank you for such a wonderful recipe. I made 2 batches and took them to work. They were a hit! All 36 bars went in a flash. 1. I slightly over cooked one pan for 5 minutes and the bars had more of a cake consistency when cooled. 2. Second pan was pulled out right at 25 minutes, so they had more of a jam like consistency when cooled. 3. You must use a glass pan. 4. You will be tempted to eat them all. Just wanted to thank you for this recipe. I was browsing your dessert recipes and seeing how you wrote this one on my birthday, and I just so happened to have all the ingredients on hand, I decided to give it a whirl. I’ve never made lemon squares before but they were delicious. The crust was insanely good. I did have to bake mine for much longer than 25 minutes though. It was too runny after the first 25 minutes. I’ll make them again for sure. I just ate a lemon square for the first time yesterday and it was delicious, but it didn’t look like these. 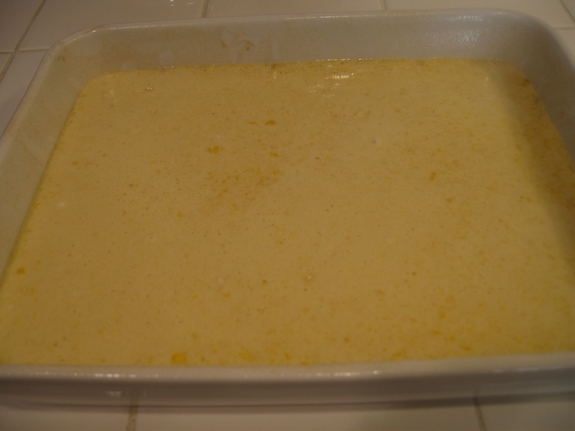 The topping was more a creamy custard of sorts (haha) and I was wondering if thats a normal thing. Also when making this recipe is it an absolute must that you top with confectioners sugar twice? All lemon squares are different. Yes, you must top twice, once while hot and the other when cooled. 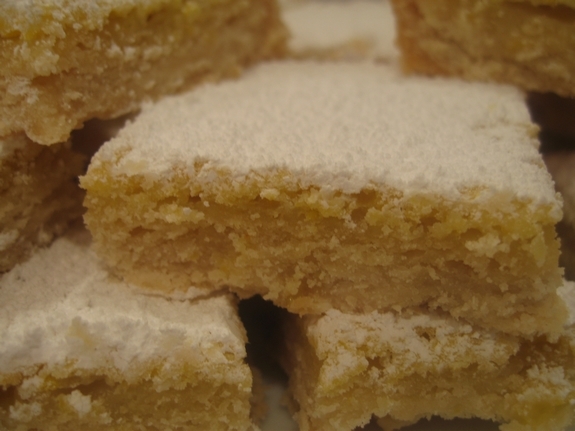 I have just made this recipe and it was amazing, my family came over for a weekend and I served them the lemon squares and they liked them so much that I had to make fourmore batches! You are mad, daft, and just my kind of cook and blogger. How’s the winery coming? I visit Oregon often and would love to be your first customer. Every one understands that our life is very expensive, however some people require cash for various things and not every person earns big sums money. Hence to get some mortgage loans and short term loan would be a right way out. Love your playful vibe and fun recipe! I was looking for a different sort of lemon bar for my July dessert of the month and might take a shot at these…if you don’t mind of course. They come out better when you put the topping on while the pastry is still hot. It allows the lemon flavor to seep into the crust a little. Yuumy. i made about 3 batches of these last christmas and everyone adored them, including myself. i had never made lemon squares before and now i have no reason to look anywhere else for a recipe. i’m about to make another couple of batches for parties, gifts, etc. my only question is that when i took the pan out of the oven, the top was dry/crusty which didn’t affect anything other than the powdered sugar didn’t really stick. i sprinkled when they were directly out of the oven and still the powdered sugar just kind of fell off. any suggestions for me? thanks! These look so good! I have a really good recipe for lemon bars but they are such a pain to get out of the pan! the only way I’ve found that I can remove them is by using a disposable foil pan and cutting the sides. I’ll have to try your recipe and see if it’s easier to remove. Also, what are your thoughts on adding some lemon zest to this? To give it some extra lemony flavor. You can add it but the squares are not lacking in lemon flavor whatsoever. I’m 11 and I made these all by myself! Turned out great but make sure to butter the pan thoroughly and thick. Also if you like your squares very lemony, add 7 Tablespoons. Those are just some of my suggestions and they taste DA BOMB! You’re awesome!! You bake like me! 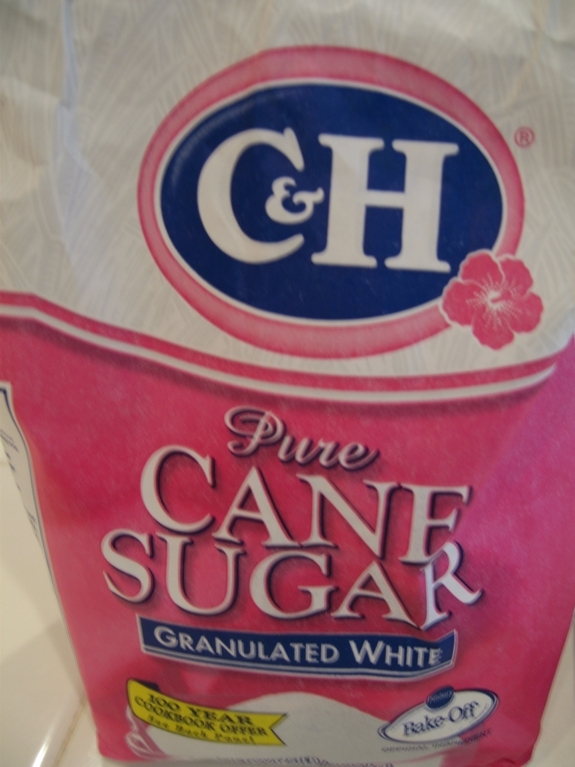 Thank you for making it sooo easy, I love to bake and try new things…. I’ve made these twice. Love them.One of my co-workers said,they are the better she ever tasted. I liked the way this recipe was presented. It was fun to read it. Cant wait to try it. I am sure it will taste heavenly. Anything with lemons in it cant be bad! I just made four batches of these for an open house on Friday. I had a similar recipe that I could not find so I googled lemon bars. I Stumbled upon your blog. I cant wait for them to cool so I can have a bite! Glad to hear it. It’s a favorite family recipe.